I recently acquired this refurbished 5x8 press. The previous owners claim it was in working condition, but I have found that the inking disk will not rotate. The teeth seem to be worn down and the dog ear wont engage the teeth. This is a L-N model so it is suppose to rotate counter clockwise. I’m not sure if there is anything else to troubleshoot before parting out the press or searching for a new disk. Any advice and suggestion are welcome. ps: Is there a way to post a video on briar? I attached pictures below for now. You may be able to file down the dog so it contacts the gear all the way across. It looks like it may be slightly askew. Yes but I’m afraid it will still slip past all the worn down teeth. When I hold and angle the dog a certain way with my hand it does kind of catch. Not ruling out your solution just afraid to take material off that I can’t put back on. Is there a way to post a video on the briar press thread?. I feel like it would be more informative. A.L.. 2 or 3 possibilities to check, perform a very very slow rotation and ascertain IF the *Dog* is approaching the teeth on the ratchet pawl,s without trying to lift the disc rather than rotate it, is there a washer/spacer missing from under the stub of the disc into the main frame, misalignment has probably caused the damage, is the *Dog* adjustable for up and down travel on the driving mechanism/shaft, it is fairly normal for the disc to be rotated by only 3/4/5 notches per impression.! … Generally beyond that, the “Arc” of the dog, leaves the ratchet teeth. Axles/Transmission etc., (The Dog and Ratchet wheel teeth are in essence HELICAL Mesh, and need to be set up as such) if the both parts were straight in each plane it would not last but a few impressions, - watch the action in slow motion,??? Short of *parting it out* as you imply, which seems drastic, if the Disc is cast iron, (apparently) in this day and age, and has been posted before on B.P. … have the teeth built up via the Bronze Welding method, and even with NO access to a gear hobbing machine re-contour every tooth by hand. ***It aint rocket science we were doing just that a long time ago U.K.!! and the same with the worn finger. It was quite normal to repair the worn finger, pawl pusher on Heidelberg Platens that advances the pile height, after the extra lump of lead as *bob-weight* had given up the ghost. If the above is beyond the Call of Duty, beg, borrow, steal, even buy, any normal NYLON, kitchen style Chopping Board and fashion a simple *Slipper* to extend the worn down length of the *Dog* a simple sight test will imply the configuration of the *dogs tooth*, … Nylon Against Cast Iron is an excellent friction free medium. *Nil Desperandum* Good Luck… Mick. Reach out to Tom at T&T Restorations, He may be able to offer a good solution to your problem. 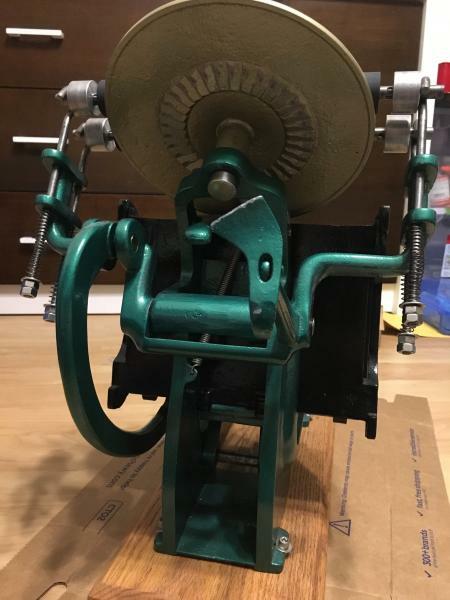 This particular press looks like a adamsletterpress sale from EBAY. You probably can look him up as well. I wish I could offer more. Good Luck. Can you turn the pawl over so that it contacts the disc teeth evenly? it looks like it is only contacting it only on the front tip. So thrilled to get so many responses on briar press. Thank you guys and gals! Mick on Monotype: I’m a little bit confused by the first portion of tests. The dog approaches the teeth which is visible I think on one of the photos I attached above. The pawl/dog makes contact and keeps going without truly engaging with the teeth on the ratchet. There is no washer under the stub of the disc. Is there suppose to be? There is slop or play on the dog attachment so that it is able to move up and down. I have some videos I can send of the press in operation to give you a better idea of my problem. I think I have to email them since I can’t seem to post them. Maybe I can paste a link to the videos on here tomorrow. Honestly it would break my little printer heart to part out the press and I couldn’t bare to see it in pieces, so I won’t be doing that. I’m pretty sure it’s cast iron. 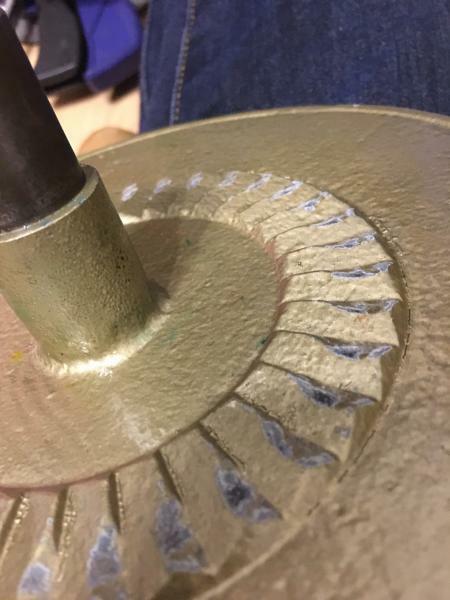 I did work in a metal shop a while back and definitely have some welder friends but, I am concerned all the heat would completely warp the disk. Maybe I’m overthinking it. I will look into nylon as well. Thanks for the encouraging words and advice. petspo1: yes I’ve talked to Tom, he actually welded a part for me on a different press (great guy). He has suggested that I adjust the angle of the dog by building up the round portion of the dog ear with a clay like product. To add weight and prevent it from flopping back so far. I haven’t had much success with that method. I will be referring back to him for more ideas. Interesting you say adamsletterpress on ebay. It was at one point refurbished by someone, and painted, as I like to call it jolly green giant. haha. Do you think this was one of his presses? 2001fred: I can push the pawl over so it’s angled to better engage with the teeth but, I’m not sure how to keep it in that position. I will attach a photo so you can see. Here is a flickr link with the photos and videos of the kelsey. Let me know if you guys cant access them. whether steel, iron, or aluminum, the teeth can be rebuilt. I would also look at building up the drive “tooth” so it lines up better, giving more “contact patch” with the disk. idk Appears your disc pawl has snapped off. Oddly enough, that angled pawl lip was the way these presses came from the Kelsey factory. It’s not broken. Mine looks just the same and also only contacts the ratchet teeth on the ink disk in the one corner just like this one. 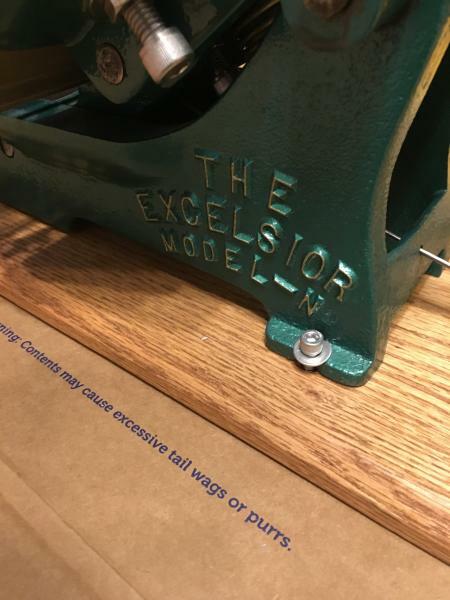 I’ve seen the same thing on other 5x8 Excelsiors. I think perhaps Kelsey just didn’t plan the pawl mechanism out very well or it was changed mid-development and nobody ever re-patterned the pawl. As to the damaged ink disk teeth, you could try rebuilding those spots with 2-part epoxy putty. J.B. Weld makes a good one. It won’t be as strong as having the teeth built up via welding but it also doesn’t run the risk of warping or cracking the disk. I would also face the teeth with epoxied-on sheet metal to protect the rebuilt teeth from wear. I do not know if this would work for you but on a treadle machine many years ago mine was working ok but every time it turned the disk it would ring out as the disk turned and caught the pawl on the back stroke so not wanting to annoy the neighbours I put some rag over the pawl held on with a rubber band or one of those plastic ties it quietened down but still worked fine, just wondering if you put a few pieces of rag over your dog ear it may be enough for a short term fix and get you printing until you repair the disk also is there a way to get a washer in the connecting part to stop it moving from side to side so much. Thank you all for the responses and help. Had a busy week so I wasn’t able to respond right away. 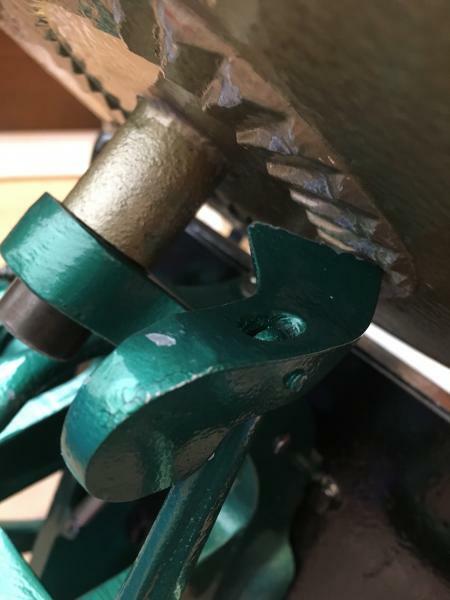 I agree with you Michael/Mephits that I think the pawl was manufactured this way because I recently saw another briar press post that had the same pawl and the damage was starting to occur on the teeth. I will either list the press for sale as is or try to fix it with the 2 part epoxy. By refacing the teeth with epoxied on sheet metal, do you mean cutting little sheet metal tabs for each tooth and adhering with epoxy? John and Liz Sones I will attempt the rag but I’m not sure much good will come of it. It truly sounds like I just need to build up the teeth. But I will give it a shot tonight. I’m not sure if there is enough space for a little washer but, if I take the pawl off to see, is there a recommend replacement pin to reassemble the pawl? I have been watching this thread with interest because I also have a Kelsey 5 x 8 with the pawl mounted exactly the same way as described by the original poster. Fortunately while wear is showing on the teeth, it is not as extensive. I currently use another press for my work, but I think I will try the nylon “slipper” idea mentioned by Mick if I ever decide to use the Kelsey. Thanks for the post Joe. It seems to be a more common problem than I thought, especially with this model. I wish the previous owner hadn’t let the damage on mine get so bad. Even if I get it fixed I’m already planning on protecting the teeth by covering the pawl with something less harsh. If the nylon works for you in the future please repost with a picture of how you fit it to the pawl. Here is a link to the other briar press post I saw on this issue.